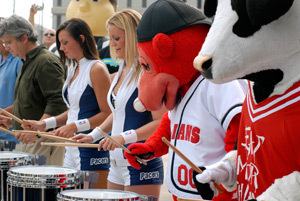 Local celebrities got to test their drumming skills against the Cavaliers drum line at a morning press event staged outside of Lucas Oil Stadium in Indianapolis, Wednesday, Aug. 5. Indianapolis Mayor Greg Ballard, Indianapolis Convention and Visitor's Association President Don Welsh, and DCI Executive Director Dan Acheson kicked off the event with a few remarks, and then the competition to find the best drummer began. Emceed by DCI Field Pass host Dan Potter, the event featured the Cavaliers drum line pitted against local news media personalities, mascots and one lucky volunteer chosen from the crowd. The selected "volunteer," who turned out to be Jeff Queen, a well-known drum corps alum, staff member and an original cast member of the Broadway show "BLAST," came in to give the Cavaliers a run for their money in the competition. The Cavaliers' line closed out the event by performing a few pieces for on looking fans—a small taste of what is to come as the Drum Corps International World Championships take over Indianapolis this weekend. View a complete schedule of all 2009 DCI World Championship events. Video by Jeff Hartowicz.